4. Practice notes you took last class. 2. I'll see you Monday. 3. States of Matter - yes, we MUST get this done TODAY! 4. Quizizz activity. Your game code is 592503. ​ 70% of higher, redo it until you get a 70% or higher! 5. VIRTUAL SNOW DAY LESSON (GRAY DAY ONLY). Get this DONE and turned in by this Wednesday. 6. HOMEWORK: NONE, unless you were absent this past Thursday. If you were absent on Thursday, you have a make-up lab worksheet on density columns. 2. Density CFA - This quiz is on Rose-Prism. 5. HOMEWORK: You are going to have a TEST over properties of matter next class! The test will cover density, density units, states of matter, buoyancy, and properties of matter. Yes, you may use a calculator and your science folder on this test. 1. Complete Do Now from yesterday. 3. Rose-Prism Density CFA for those who didn't complete the quiz. ​4. HOMEWORK: You are going to have a TEST over properties of matter next class! The test will cover density, density units, states of matter, buoyancy, and properties of matter. Yes, you may use a calculator and your science folder on this test. 2. Collect virtual assignment (GRAY DAYS ONLY!) Turn into the basket. NOTE: I gave you the virtual assignment on Monday, January 29. If you weren't here on Monday, I gave it to you on Wednesday. I even gave you the opportunity to get another copy today from me. I'm going to post this assignment now. This assignment is due on Tuesday for all students I see on GRAY DAYS. 3. Collect density column worksheet. Turn into the basekt. a. You may use your folder on this test. b. You may use a calculator on this test. 7. HOMEWORK #2: Gray Day Students ONLY. Your virtual assignment is due at the START of Tuesday's class. 3. 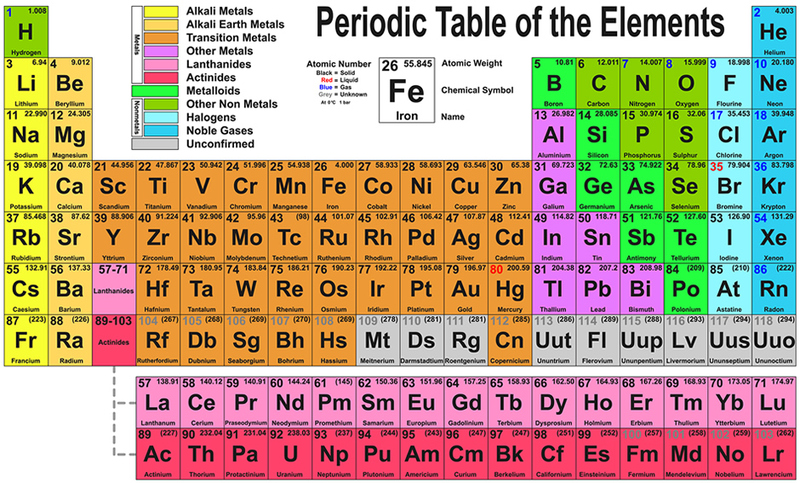 Periodic Table Reference Picture. This is the periodic table I'm referencing when coloring the Periodic Table. If you lose your Periodic Table I gave you in class to color, you can always print off a new Periodic Table and recolor it. 5. HOMEWORK: PEN assignment due by the START of our next class. You must get at least a 70% on the assignment. You may redo this assignment until you get a 100% on it. 6. 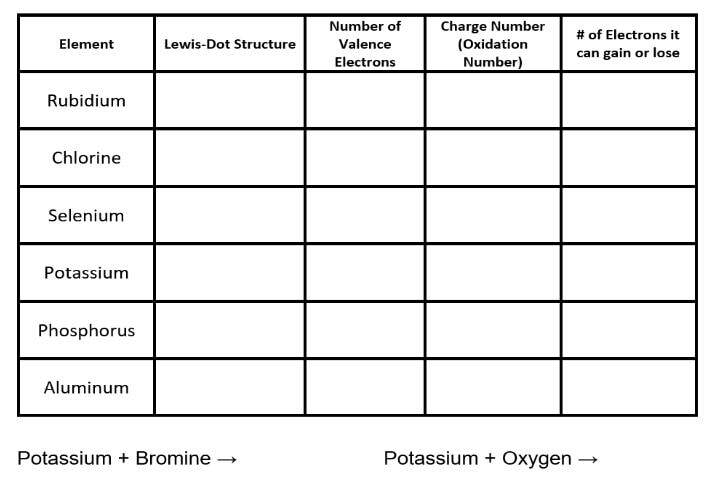 Practice the notes from the periodic table. ​7. HOMEWORK for BLUE DAYS ONLY. I will give you your virtual snow day make up assignment. This assignment is due next Monday, February 19 or BEFORE. 6. HOMEWORK FOR BLUE DAYS ONLY: Complete both sides of your element project by February 22. ​Friday, February 16 - Gray Day . . . Monday is a gray day too! 5. 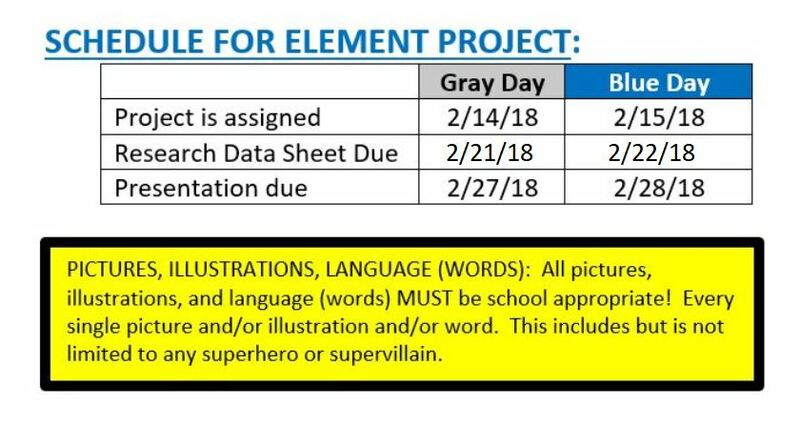 HOMEWORK: The element project data sheet is due on Tuesday, February 21 at the VERY start of class. Monday, February 19 and Tuesday, February 20 -- I will be back on Wednesday. 2. Complete worksheet given to you by my substitute. 3. Take quiz over worksheet. 4. Turn in the worksheet. Put it in the basket. Make sure your name is on it! 5. You did complete the Quizizz . . . right? The game code is located on the worksheet you turned in. 6. Work on your element research project. 7. HOMEWORK: None. See you tomorrow. 2. TURN in your missing work! 3. Complete the review guide for you test. The test is the next day I see you. 4. Your element project is due on the very next day we meet too! 5. HOMEWORK: Finish your review guide and your element project! 1. Do Now - You need a half sheet of paper. I will tell you what I want you to do on this paper in just a moment.